Since I launched my own freelance tech PR and marketing business a few weeks ago, I’ve experienced something that has taken me somewhat by surprise: abundance. Folks from all corners of my network have reached out to me to offer introductions and referrals to potential clients. Even other agencies and freelancers (that is, would-be competitors) have reached out to form partnerships where we can offer each other referrals, advice, and guidance. (By the way, if you want to learn more about the importance and value of your network, check out Heidi Isern’s three reasons to be a social butterfly). There are two ways of thinking that influence how you react to the world: abundance thinking and scarcity thinking. One leads to success, happiness, fulfillment, joy, and peace; the other leads to failure, discontent, fear, suspicion, and bitterness. 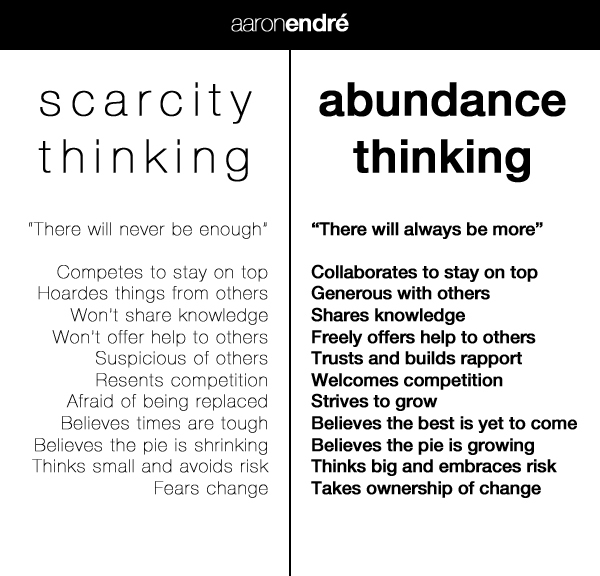 Behold: a visual guide to scarcity thinking vs. abundance thinking! Many people live in a world of scarcity. And it’s no wonder: we’re taught from an early age to be competitive instead of collaborative. We compete with classmates for the grades; with applicants for the job position; with coworkers for the promotion; with other companies for the customer. The ironic thing is that we’ve been taught that in order to be successful we must compete for scarce opportunities and the truth is that people who think in terms of scarcity can’t be successful. And many people, unfortunately, are unhappy and unfulfilled. Why? Because when we believe that opportunities and options are limited, we become limited. When we choose to be competitive with others, we lose out on the opportunity to collaborate and differentiate. When we act out of fear, we stifle our ability to grow. But when we embrace the crazy notion that, in fact, opportunities are abundant and that our abilities are unlimited, our possibility for happiness becomes unlimited. I know it sounds cheesy, but the idea of abundance applies to business strategy, too. In fact, I highly recommend the book Blue Ocean Strategy: How to Create Uncontested Market Space and Make Competition Irrelevant by W. Chan Kim and Renée Mauborgne. The premise is simple: rather than enter into an existing marketplace and compete head-to-head with other vendors, entrepreneurs should strive to create new demand in an uncontested market space. So as I go about building my business I’m presented with a choice: I can compete with every tech PR/marketing agency and freelancer I meet—or I can embrace the idea that there’s more than enough business for everyone, choose to learn and grow as much as I can, differentiate myself based on my interests and strengths, do excellent work, foster meaningful partnerships and share the wealth. The choice is pretty clear. And while most people probably oscillate between thinking in terms of scarcity and abundance, I think we can all agree that a vast, abundant blue ocean of opportunity is a thing worth working toward. Well presented. I think it’s really hard to argue the contrary. Most people are indeed running on fear and hoarding / protective / resentful. That type of thinking attracts negative results. I think it’s in all of our nature, and getting on that abundance side requires real effort and reprogramming your brain. Though I’d never heard it described like this, I have been making more effort over the last five years to get on that abundant side, and minimize the small-thinking on the left side. Life is much richer and you have a lot more serendipitous moments where good things just seem to fall out of the sky. I think the real trick on the abundance side is trusting that it will work. You can’t both be helping people with no expectations in return and also resenting them at the same time if nothing happens as a result. Seems like you have to commit entirely.